“Between Lake Geneva and Mont-Blanc, at the heart of the region known as Les Portes du Soleil, Les Gets (1172 m ­ 2002 m) is a heaven that everyone wants to keep as a personal secret. 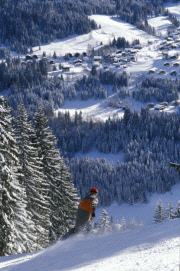 “Families should find Les Gets an attractive venue with great ski school provision for the little ones. Ski-to-your-door accessibility is also a huge bonus.” according to ifyouski.com.